The latest data published by the National Equine Health Survey (NEHS) 2018 stated that, of the 13,873 horses recored, laminitis affected 5.4% of the population with 43% for the first time and 57% experiencing a repeat episode. This illustrates the fact that once a horse has had laminitis they are more prone to it happening again, which is why it is vital to try and stop it happening in the first place. If your horse has laminitis then it is important to identify the underlying cause. Researchers suggest that we should consider laminitis to be the symptom of other diseases such as Equine Metabolic Syndrome (EMS) or Pituitary Pars Intermedia Dysfunction (PPID, formerly known as Cushing’s Disease). The underlying endocrine problems of EMS and PPID make the horse more vulnerable to laminitis. The trigger that ultimately results in the clinical signs of laminitis is often diet-related and is usually due to excessive consumption of sugar or starch. Our Laminitis Trust approved fibre horse feeds have been developed to meet the nutritional requirements of horses and ponies prone to laminitis. Low in sugar and starch, but high in fibre we have a range of feeds suitable for any horse or pony. Below we explain the benefits and features of each of the Laminitis Trust approved fibre horse feeds in the Dengie range. A tasty blend of nutritious alfalfa with high-quality soft straw it is ideal for horses and ponies that are prone to laminitis and also need to watch their waistline. The inclusion of real mint, fenugreek and alfalfa pellets will create interest for fussy eaters and a dash of rapeseed oil provides slow-release energy and coat shine. Free from molasses and preservatives. A fully balanced, low-calorie, high-fibre feed for leisure horses and ponies containing essential nutrients for healthy hooves. Packed with B vitamins, including biotin to improve hoof quality – provides 15mg of biotin for a 500kg horse when fed at the recommended rate (500g per 100kg bodyweight). 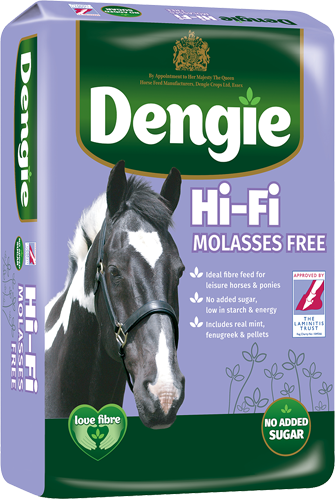 Free from molasses and preservatives. 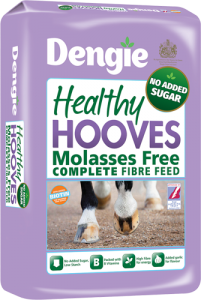 Alfa-A Molasses Free is naturally low in sugar and starch at 4.5% and 2% respectively, but is packed full of tasty extras such as real mint, fenugreek and alfalfa pellets and so this conditioning fibre feed will tempt the fussiest of horses. 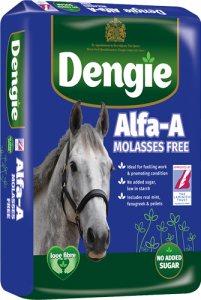 Alfa-A Molasses Free is suitable for horses that require a low level of sugar and starch in their diet, but that are working or need help to gain weight. 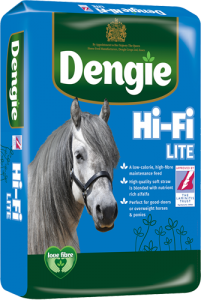 Providing just 7.5MJ/kg of Digestible Energy Hi-Fi Lite is perfect for good-doers or overweight horses and ponies. High-quality soft oat straw is blended with nutrient rich alfalfa to create a low-calorie fibre feed that can be used a total or partial hay replacer. Feed according to the work done – not what you plan to do! 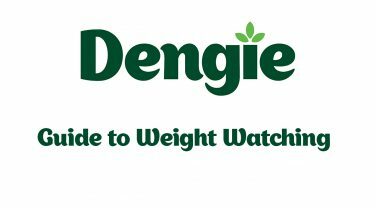 Weigh your haynets to help monitor calorie intake. Soaking hay can help reduce the sugar and starch content. Research has shown that 16 hours soaking at 16 C removed the most sugar but this isn’t practical for everyone to do. Soak for at least an hour, if you can. Use small-holed haynets or try double netting to help reduced rations last longer. Try to feed low-calorie, highly digestible fibre feeds that are low in sugar and starch. Feed little and often to mimic the horse’s natural grazing behaviour and to help keep the digestive system healthy. Lose the duvets! To help burn off a few extra calories, try not to over-rug, especially if horses aren’t clipped or we’re experiencing mild weather. 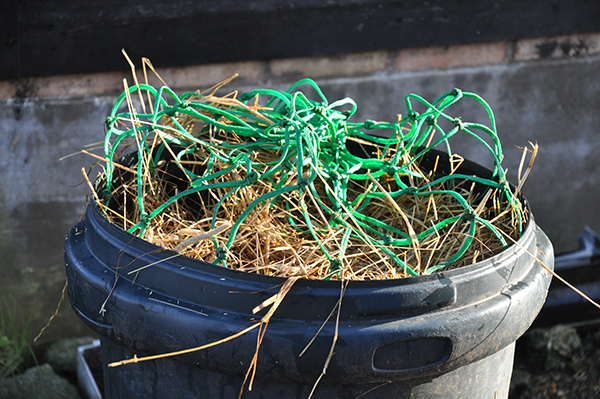 Use smaller nets so you’ll be less tempted to overfill them with hay or haylage! Exercise your horse or pony. Try schooling, lunging, long-reining and hacking for at least 20 minutes a day – all of which will help your horse’s waistline. Weigh all feed and forage given. The latest research published by the National Equine Health Survey (NEHS) 2015 stated that, of the 15,000 horses included in the study, 23% were described as overweight - up from 16.9% the previous year. Being overweight predisposes horses to diseases such as laminitis, EMS and PPID (Cushing's Disease).